At the end of 2008 our commercial and production association «ReFurbished Service» applied for registering its trademark RF™. It is no secret that for more than 2 years we are a success in producing and selling our alternative cartridges for laser printers, which major of our customers have got accustomed to see in our firm green cartons. Starting from 2009 we plan increasing of our products volumes, as in the present-day economic conditions it becomes more and more popular not in this country only but in the neighbouring states - Lithuania and Estonia. At the same time we developed a special consumer programme – «Ekonom pack RF™» – whereby the major share of our cartridges is sold twice as low and in some cases thrice as low of just the same original cartridges! Along this we are using only quality components and consumables. The process of repair work is performed on specialized equipment in a specially equipped room. For those organization managers who are seeking for saving and therefore using services of “black refillers” or are permitting cartridge refilling in their rooms, we would like to notice that such processes are not only unhealthy for human respiratory system, but also may cause asthmatic illnesses. 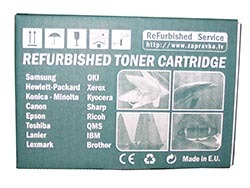 HOW TO DISTINGUISH OUR COMPANY CARTRIDGES FROM OTHERS? Pursuant to the developed and approved technology, all cartridges that got through our production irrespective of the fact whether they were refilled, refurbished or produced as the finished products, are packed and marked according to the fixed routine. First: «The process control label» is stuck on each cartridge. Starting from January 2012 there has been introduced the new quality control system!!! Introduction of the new system allowed improving control over the quality of the manufactured products and at the same time to neutralize the most fault-finding customers’ distrust of the fact, how full our cartridges are filled with toner. Now it is possible to check its filling completeness having compared the specified weight with parameters of the standards for filling this particular cartridge given in Internet. For this purpose we recommend you to apply tables of the manufacturer of toner powders - Static Control Components, which we generally use for filling cartridges. The value of the resource of a cartridge produced by us is in compliance with the International production standards ISO/IEC 19752 and ISO/IEC 19798. It means that the cartridge running resource RF™ complies with the resource of an analogous cartridge of the original producer upon the standard page filling at the rate of 5%. In addition: a «brand label» with the initials of the official brand RF™ registered by us is stuck on each new cartridge. In this event the label colour is in line with the cartridge colour- black, cyan, yellow or magenta. Secondly: each cartridge is packaged into an opaque LDPE polyethylene 90 micrometers thick pack which protects it from liquid and dust impact during the long storage. Thirdly: every cartridge packaged in polyethylene has “marking label” which shows a name of cartridge and its compatibility with particular printing equipment(s). 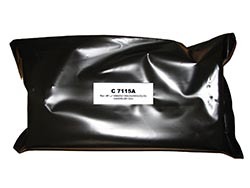 This label is put on opaque LDPE polyethylene pack as well as on cardboard box (on the frontal surface). For some cartridge types there are “economical” variants of package when two cartridges are packed into one cardboard box are packaged by two cartridges and put two labels on the frontal surface. Fourthly: each cartridge ready for the use is put into a cardboard box on the top part of which supplier’s warranty terms are shown and there are terms of cartridge storage and transportation indicated on the side. Fifthly: an “Information label” is put together with cartridge inside each cardboard box that is sticked on visible part of typing equipment later on. In case if you will have some questions concerning use of our cartridges or printing equipment, you can call or e-mail to ou service centre by phone number or e-mail address which are listed on the information label. Thus, if you bought our cartridge or used our service, you will obligatory receive it in accordance with abovementioned technology. 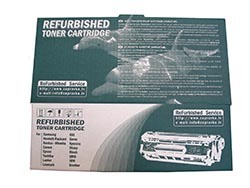 If some of cartridge package elements are missing it means that we did not produce this cartridge !!! WorkStation - this is a working station of closed cycle, equipped with two filters of cartridge type (standard filters) and one HEPA filter. Power supply and compressed air should be provided for the work of this station. Single-phase network of alternating current with voltage 220 V. Power consumption – 4.4 kW. For the normal work of station compressed air should be supplied, volume 0.054 m3 per minute @ pressure 6.8 bar. (Two filters of cartridge type, one – HEPA filter), SCC. 5. 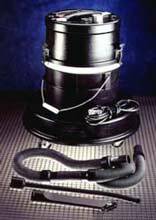 Built-in cleaning system of standard filters. 6. Indicator of filter pollution level. 7. Capacity of built-in engine – up to 1000 m3/hour. Main distinguishable property – extraction parameters declared by manufacturer correspond completely to its actual work characteristics. Station shanks are equipped with wheels to provide mobility of the station within production premises. We have good experience enough of working with equipment of different manufacturers in order to claim with full responsibility that working stations SCC are the most reliable, convenient and the most productive equipment from the whole offered range to compatible cartridges producers at present. Standard filters are intended for preliminary rough air cleaning from particles sized up to 0.5 micrometers with efficiency 99.99%. Final cleaning of air flow is performed on HEPA filter which provides prevention of particles up to 0.3 micrometers with efficiency 99.997%. Noise level with these implemented filters is not higher than 72.5 dB. 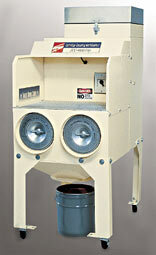 We offer you to choose this model because it provides sufficient power for performing the work. Unfortunately, air compressors with less volume are quickly loosing their ability to deal with standard amount of work and are producing much more noise as well. These both conditions are limiting the choice. We recommend using ATRIX HCTV as it is constructed especially for these tasks. Compressed air ionizer. This equipment is not necessary during cartridge refill or renovation process. Ionizer is provided for taking off electrostatic potential from cartridge work surfaces and its components. The usage of ionizer allows improving quality of the final product and reducing time spent on production of one product.